In his latest work, Cliff expands on the tips and techniques required to use desktop 3D printers (of the FDM kind) to solve utility oriented issues. You may wonder what any of this has to do with a Zombie Apocalypse? The Zombie Apocalypse is the analogy used by the author to describe a situation that emphasizes the need for independence, utility and practicality. 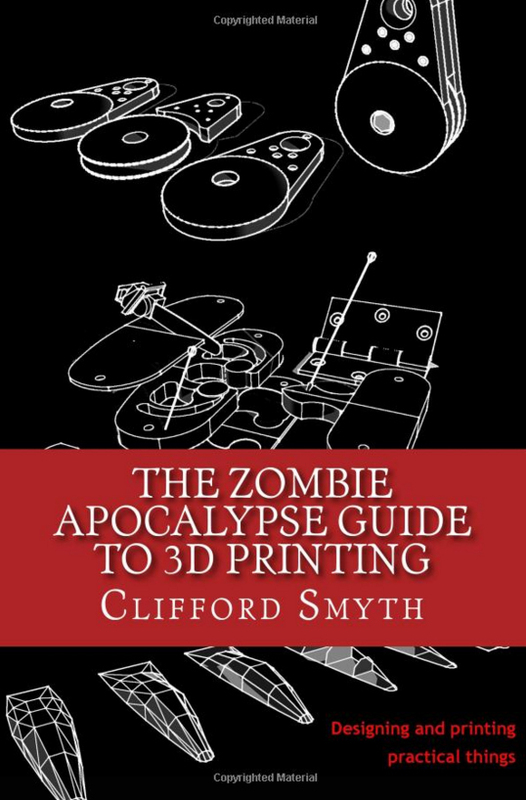 In other words, this book prepares you to use your 3D printer to fight off the next zombie onslaught or in a more mundane way to repair things around the house. 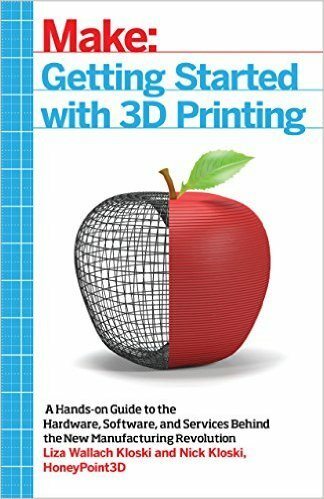 The first chapter starts off with covering the basics concepts one must be aware of when designing for 3D printing: form and material, print orientation and strength, overhangs and bridges. The author explains how to optimize objects for printability by reducing complexity through part orientation and reduction of support structures. He then goes on to describe how slicer settings and errors can lead to longer printing times and potentially failed prints. 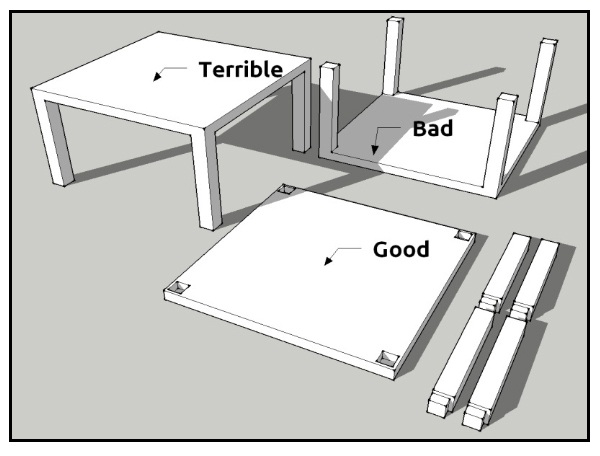 The remainder of the first chapter „Determining failure and working loads“ gets quite technical but shows you how to calculate the working load limit for any 3D printed part that needs to fulfill a critical function. 3 different versions of the same model, demonstrating design reorientation to optimize printability © Clifford Smyth. Chapter 2 takes a closer look at the two main design paradigms in CAD: prism extrusion and wire-frame lofting. Cliff explains the intricacies of both 3D modeling techniques, their advantages and drawbacks. The chapter then moves on to explain how prototyping can be used for repairing broken or lost parts. Cliff uses the example of a chainsaw that he repaired by designing and 3D printing a new trigger that brought the machine back to life. 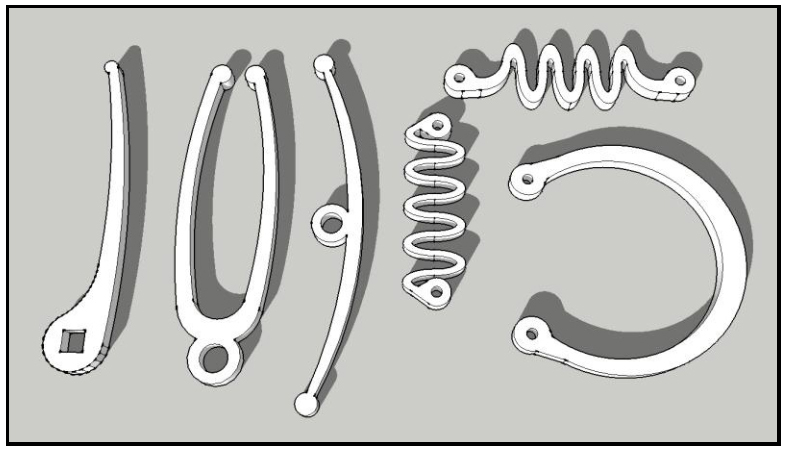 Chapter 3 really gets practical by looking at how to design and 3D print hinges, latches and springs. By explaining the concept of overextrusion, the author introduces the notion of tolerances that need to be build into a 3D model in order for it to fit together as planned. Cliff then takes a look at how the material properties of ABS, PLA, nylon, TPU or PET can be used to their advantage when producing models that need to flex such as hinges or springs. Examples of 3D printed spring designs © Clifford Smyth. As you might expect, a successful print starts with a level print bed and good print adhesion. That's exactly where Chapter 4 begins before it moves on to a very technical section on calibrating your printer's X, Y and Z axes as well as the extruder. Thankfully this section of the book contains quite a few pictures to explain the effects of bad calibration and how to spot them. The chapter finishes off with „Printing for Production“, by looking at ways that one can speed up a 3D printer when printing models in bulk. Appendix 1 contains three case studies which serve to illustrate some of the concepts described in the preceding chapters. In the first case study Cliff shows the reader how the prototyped a replacement sewing machine pedal using the technique of nozzle overloading. By tricking the extruder into thinking that the nozzle is wider than its actual size, Cliff was able to print wider and thicker layers, reducing the print time from 4 hours 24 minutes to 1 hour 39 minutes. The second case study is a replacement for an arrow rest of a recurve bow. Here Cliffs nicely illustrates how he iterated through various materials from ABS, PET and T-glase to nylon in order to produce a design that is durable enough for the intended use. The final case study is also bow sports related, the design of arrow fins for fletching. This application is really challenging as it requires a part that is flexible, lightweight yet able to withstand high stress. Here again Cliff iterates on the shape and materials until he finds a cheap, fast to print yet accurate design. 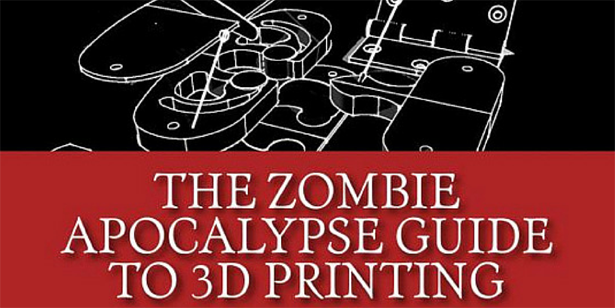 The second appendix covers a very specific topic that might not be of interest to all readers: Printing off the grid – or 3D Printing for Preppers. As Cliff spends part of the year in the Caribbean, in areas without reliable power supply he has devised several options to keep his 3D printer running even without grid power. The 2nd appendix explores the pros and cons of the various alternative power sources but implementing any of the suggested options is only for the properly skilled reader. You are right, the book assumes that you had at least some basic CAD knowledge. Now, if you are learning CAD specifically for 3D printing then it will come in handy from the start since it teaches you some basic concepts that can have an immediate impact on your 3D printing endeavors.